This is not your (virgin plastic, non-compostable, non-recyclable) red party cup. This is your World Art™ Renewable and Compostable Cold Cup! This cup holds drinks without leaking, rocks its environmental attributes, and is always the life of the party. Best of all, when its time to go home, this cup is 100% certified compostable and returns to the soil...until your next bash. 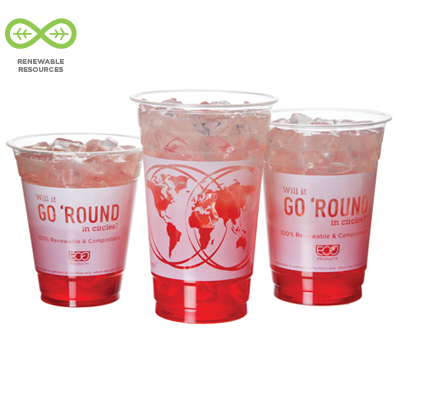 These flat lids are a must for anyone serving cold drinks out of our GreenStripe® cold cups. For iced coffee drinks with whipped cream and other toppings, try our dome lid with straw hole. Top off our GreenStripe® cold cups with this no hole dome lid designed to keep tasty toppings inside.